Home of the Muses in Greek myth, 8,061-foot (2,457-meter) Mt. Parnassus is one of the star attractions of Parnassos National Park. Activities on offer span the gamut from skiing and snowmobiling to climbing and mountain biking via hiking and 4WD adventures, but most travelers experience it only on a visit to the ancient site of Delphi. There is no charge to visit Parnassos National Park or to soak up the scenery as you drive by Mt. Parnassus’ stark peak. You’ll need a pass to ski either Kellaria, with 10 lifts and mainly intermediate slopes, or Fterolakka, with seven lifts and some challenging off-piste. Most international visitors to Greece discover Mt. Parnassus as part of a trip to ancient Delphi, a UNESCO World Heritage Site once famed for its female prophet, the original oracle. Mt. Parnassus is of particular interest to fans of Greek and Roman mythology, lovers of wildflowers, and ski addicts. Weather can change quickly on Mt. Parnassus. Bring warm gear when hiking in fall or spring. While parts of the ancient Delphi site are accessible for wheelchair users, Mt. Parnassus is not generally an accessible destination. Mt. Parnassus towers above Delphi in Sterea Ellada on the Greek mainland. With no ski buses, driving is your only practical option if you plan to hit the slopes, while Mt. Parnassos National Park is also best visited by driving or on a tour. The bus ride from Athens to Delphi takes 2.5 hours, so many travelers prefer to visit the site and Mt. Parnassus on an organized tour. Late spring (late April to mid-May) is a wonderful time to hike on Mt. Parnassus, with a spectacular display of wildflowers and, often, scented herbs underfoot. The ski season typically runs from mid-December until the end of April, with the slopes at their busiest on weekends, during the Christmas–New Year period, and over the Greek Orthodox Easter holiday. Mt. Parnassus has given its name to more than just a mountain in Colorado. In Greek and Roman mythology, it’s best known as the home of the Muses, goddesses of literature, science, and the arts, and often stands as a synonym for poetry and big ideas. It’s also associated with Apollo, the god of prophecy, who was worshipped at Delphi on its lower slopes. Get the most out of your time in Greece by traveling from Athens to Delphi. You’ll save time organizing transport by having a private vehicle to take you between dispersed attractions around Delphi. Highlights include Levadia, The Oracle of Delphi, the Museum of Delphi, and the Sanctuary of Athena Pronea. Some of Greece’s most astonishing and historic landmarks are within driving distance of Athens. On this two-day tour you’ll visit two of these landmarks, the ancient religious site Delphi and the monumental rock formations of Meteora, without the stress of having to organise a rental car and navigating local roads. Along with these two renowned UNESCO World Heritage Sites, explore the battlefield of Thermopylae and the charming Greek towns Arachova and Kalabaka. See two of Greece’s most impressive UNESCO World Heritage sites on this 3-day tour of Delphi and Meteora from Athens. First, journey back to ancient Greece on a tour of Delphi, see the magnificent Temple of Apollo and learn about Delphi’s importance as the home of the Pythian Games and the oracle of Apollo. After an overnight in Kalambaka, continue to Meteora to admire the medieval monasteries perched dramatically on the mountaintop. This tour includes accommodation, some meals and round-trip transport from Athens by air-conditioned coach. Visit four UNESCO-listed Greece highlights without the inconveniences of traveling alone or shared touring on this private 3-day private experience from Athens. Settle into a private vehicle for Mycenae, Epidaurus, Olympia, and Delphi; and enjoy 4-star hotels each night. Plus, choose to self-guide or hire local guides (own expense) as you please. Ideal for couples, families, and friends wanting a personalized and comfortable overview of Greece’s classical and Byzantine treasures. Ancient Delphi lies on Mt. Parnassus just northwest of Athens: a convenient day trip from Greece’s capital. Save the fuss of going by rental car or public bus with this full-day small-group tour by air-conditioned minivan. Relax en route without having to drive or jostle for seats, visit the Oracle of Delphi, Delphi Museum, and Arachova village. Tour the UNESCO-protected ruins with a guide to learn their history and myths—information you’d miss if exploring independently. Don’t miss a visit to one of the most captivating historical sites in Greece on a private, full-day tour to Delphi. 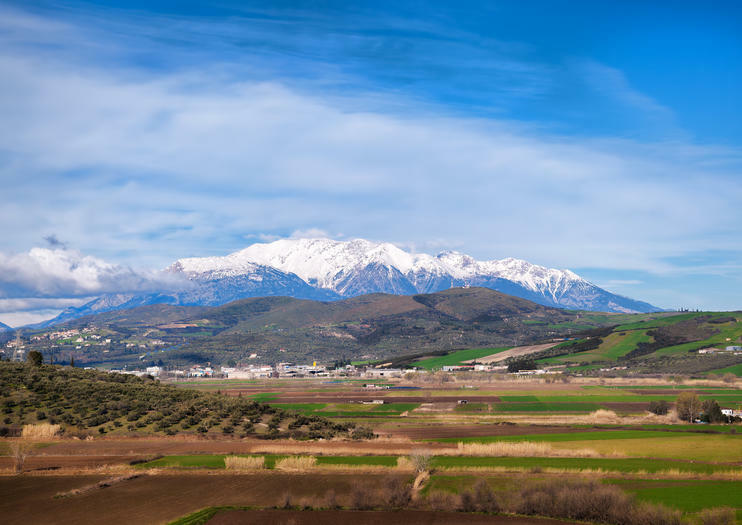 Travel up the slopes of majestic Mt Parnassus to the UNESCO-listed archaeological site that dates back at least 3,500 years and was considered to be the center of the world in ancient Greek mythology. Learn about the mysterious Oracle of Delphi and the Pythian games, and marvel at sacred artifacts housed in an on-site museum. Afterwards, stop for lunch and soak up spectacular views in the nearby mountain town of Arachova. Admire Athens’ star attractions and the classical site of Delphi on this 2-day Athens Super Saver — combining two best-selling tours for one discounted price. On one day, enjoy a half-day sightseeing tour of Athens’ highlights, including Syntagma Square and a guided walk around the stunning monuments of the ancient, rocktop Acropolis. On the next or previous day — your choice — take a day trip to Delphi, one of Greece’s greatest ancient treasures. Tour the mountainside site, with its Temple of Apollo, stadium and sanctuaries, and hear all about its captivating history. When you’ve exhausted all of the ancient sights of Athens, head out of town on this two-day trip to Delphi and Olympia. On this private tour, spend the first day exploring the Delphic ruins, including the Temple of Apollo and the Castalia Spring, without any strangers to hold you up or distract you from your sightseeing. Spend the second day discovering the wonders of the birthplace of the Olympic Games. You can even run on an a track dating back to the first Games! Wander in the ancient streets of Delphi and beyond with this tour which leads you out of Athens and into the Greek countryside, full of places that became legends. From Byzantine art to ancient oracles, living monasteries to the olive sea, this tour gives you a taste of all that the Greek countryside has to offer. A UNIQUE BIKE & HIKE PROGRAM IN GREECE with all transfers & half board included. Our holiday combines hiking in two of the most naturally diverse & geographically beautiful locations, along with their accompanying UNESCO sites, with a biking tour of the Pelion Peninsula; Mythical 'Mountain of the centaurs' and designated 'Natura 2000' area of outstanding natural beauty with clean mountain air, ancient forest, pristine blue waters, & dotted with over 23 picture post-card 'stone villages' (location for the movie ‘mama mia’). The program is thoughtfully designed with over 15 years of experience & carried out at each part by highly experienced English speaking professional guides. Behold Delphi, Galaxidi, Hosios Loukas and the wonders of Ancient Greece on this private, 2-day tour from Athens. Stay out of the tourist crush and visit three of Greece’s must-see sights with only your private group and guide in tow. Traverse the timeworn ruins of Delphi and learn about the UNESCO–listed site’s history; wander through the pretty coastal village of Galaxidi; and stand in awe before Hosios Loukas, a stunning monastery of Byzantine construction. Relax with overnight accommodation, transport and select meals included.